CBI - China: Day 60 of 154 of the Japanese Invasion of Manchuria. Spain: Day 123 of 985 of the Spanish Civil War. CBI - China: Day 28 of 29 of the 1st Battle of Suiyuan. Spain: Day 488 of 985 of the Spanish Civil War. CBI - China: Day 133 of 2,987 of the 2nd Sino-Japanese War. Day 96 of 106 of the 2nd Battle of Shanghai. Spain: Day 853 of 985 of the Spanish Civil War. CBI - China: Day 498 of 2,987 of the 2nd Sino-Japanese War. Day 36 of 81 of Japan's Operation GUANGDONG. CBI - China: Day 863 of 2,987 of the 2nd Sino-Japanese War. Day 2 of 381 of the Battle of South Guangxi. ETO - UK: Day 72 of 258 of the Blitz. RAF bombers drop on four targets in Hamburg, Germany. East Africa: Day 160 of 537 of Italy's East African campaign in the lands south of Egypt. CBI - China: Day 1,229 of 2,987 of the 2nd Sino-Japanese War. Day 367 of 381 of the Battle of South Guangxi. CBI - Thailand: Day 47 of 221 of the Franco-Thai War (Vichy France vs Thailand). Russian Front - Finland: Day 141 of 142 of Operation SILVER FOX, a joint German-Finnish campaign to capture the Russian port of Murmansk in the Arctic. Russian Front - Finland: Day 139 of 140 of Operation ARCTIC FOX, a joint German-Finnish campaign against Soviet Northern Front defenses at Salla, Finland. Russian Front - Finland: Day 148 of 164 of the Battle of Hanko. The Soviets will be forced off their leased naval base. Russian Front: Day 148 of 167 of Germany's Operation BARBAROSSA. Russian Front - North: Day 70 of 872 of the Siege of Leningrad. Russian Front - Center: Day 46 of 98 of the Battle of Moscow. Russian Front - South: Day 18 of 248 of the Siege of Sevastopol, Crimean Peninsula. German 11th Army takes Kerch in the eastern Crimea. MTO - Libya: Day 221 of 256 of the Siege of Tobruk. East Africa: Day 525 of 537 of Italy's East African campaign in the lands south of Egypt. CBI - China: Day 1,594 of 2,987 of the 2nd Sino-Japanese War. ETO - France: US 8th Air Force: Flying Spitfires, the 4th Fighter Group attacks targets of opportunity along the French coast. Russian Front - North: Day 435 of 872 of the Siege of Leningrad. Russian Front - North: Day 196 of 658 of the Siege of the Kholm Pocket, USSR lays siege to the Kholm Pocket but the Germans hold out for a about a year and a half. Russian Front - South: Day 142 of 150 of Germany's CASE BLUE, the failed offensive to take the Caucasus oil fields. Russian Front - South: Day 86 of 165 of the Battle of Stalingrad, bloodiest battle in human history. MTO - North Africa: Day 9 of 9 of Operation TORCH, the invasion of Morocco and Algeria. The Allies have liberated both nations. MTO - Libya: US 9th Air Force P-40s fly patrols over the area of Germiston. MTO - Tunisia: US 12th Air Force B-17s attack the Sidi Ahmed Airdrome in Bizerte. CBI - China: Day 1,959 of 2,987 of the 2nd Sino-Japanese War. PTO - Alaska: Day 163 of 435 of the Battle of Kiska, Aleutian Islands. The US and Canada will defeat the Japanese invaders. PTO - Malaya: Day 271 of 357 of the Battle of Timor Island, a long guerrilla war ending in Japanese victory. PTO - New Guinea: Day 119 of 119 of the Battle of the Kokoda Track. US and Australian troops join up to assault the Buna-Gona bridgehead, the last Japanese stronghold in northern Papua. PTO - Solomon Islands: Day 102 of 187 of the Battle of Guadalcanal. ETO - Norway: The RAF bombs the heavy water (atomic) plant at Telemark, which the Germans are attempting to repair. US 8th Air Force heavy bombers attack targets at Knabena and Rjukan. Russian Front - North: Day 800 of 872 of the Siege of Leningrad. Russian Front - North: Day 561 of 658 of the Siege of the Kholm Pocket. USSR lays siege to the Kholm Pocket but the Germans hold out for a about a year and a half. Russian Front - South: Day 85 of 122 of the Battle of the Lower Dnieper River, USSR. MTO - Greece: The island of Leros surrenders to the Germans. US 12th Air Force B-25s bomb at Eleusis. MTO - Yugoslavia: US 12th Air Force B-25s bomb the airfields at Sibenik. MTO - France: US 15th Air Force B-17s and B-26s bomb airfields in the southern part of France. CBI - China: Day 2,324 of 2,987 of the 2nd Sino-Japanese War. Day 15 of 49 of the Battle of West Changde. PTO - New Guinea: Day 59 of 219 of the Battle of Shaggy Ridge. PTO - New Guinea: Day 56 of 162 of the Battle of the Huon Peninsula. PTO - Solomon Islands: Day 16 of 295 of the Battle of the Bougainville Islands. ETO: With Antwerp, Marseilles and other ports now liberated and available for Allied use, the US Red Ball Express truck convoy system is shut down, having served its purpose beyond expectations during its three months of service. The Red Ball Express, primarily operated and driven by African-American soldiers, was an enormous truck convoy system created by Allied forces to supply their forward-area combat units moving quickly through Europe following the breakout from the D-Day beaches in Normandy. The route was marked with red balls and closed to civilian traffic, the trucks were marked with red balls and given priority when on regular roads. The use of a red ball for signaling was used as early as the 1800s, with a flag with a red ball on a white field indicating the important ship of a vice admiral. The term "Red Ball" was later a railroad phrase referring to express shipping for priority and perishables (originated by the Santa Fe system ~ 1892, extensive by 1920s), where the trains were marked with red balls and the cleared express use tracks were marked with red balls. 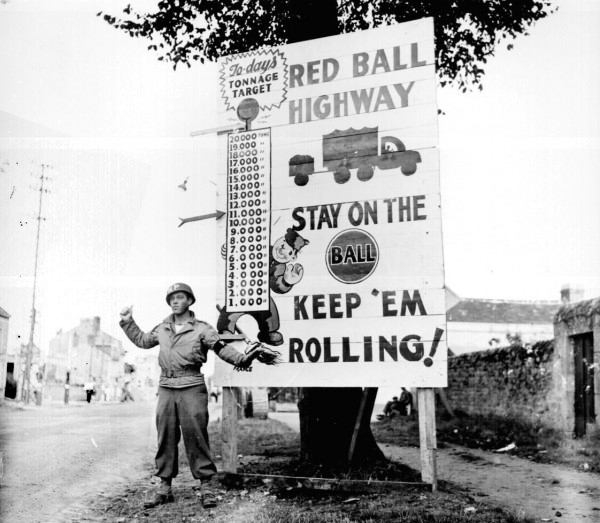 Some later trucking companies adopted the "red ball" name, and Patton in 1940 used the Texas "Red Ball Express" trucking company on contract to supply the Louisiana Maneuvers. Post WWII use of the "red ball" phrase was for expedited legal cases of murder or similar importance. Although the convoys were a primary target of the German Luftwaffe, by this time in 1944 German air power was so reduced that these tempting and typically easy targets were rarely attacked. The biggest problems facing the Express were maintenance, finding enough drivers, and lack of sleep for overworked truckers. ETO - France: Day 108 of 284 of the Battle of Brittany. ETO - France: Day 63 of 236 of the Siege of Dunkirk. ETO - Germany: Day 59 of 145 of the Battle of Hürtgen Forest. ETO - Germany: US 1st and 9th Armies launch a new attack east of Aachen toward the Roer Dams (6 miles away) with four divisions on a 25-mile front. US and Royal Air Forces bomb the German frontline. Russian Front - Finland: Day 63 of 223 of the Lapland War. Finland and Russia have joined forces to kick the Germans out of Finland's most northern province. Russian Front - Center: Day 33 of 206 of the Battle of the Courland Pocket in Latvia. Russian Front - Center: Day 26 of 99 of the Siege of Memel, a border town of Lithuania and East Prussia. Russian Front - Center: Day 64 of 72 of the Battle into East Prussia and northern Poland. Russian Front - South: Day 19 of 108 of the Battle of Budapest, Hungary. Russian Front - South: Day 64 of 72 of the Battle of Belgrade, Yugoslavia. MTO: US 15th Air Force B-17s and B-24s attack targets in Germany, Yugoslavia, and Austria. MTO - Italy: The British 8th Army advances near Forli. US and Royal Air Forces provides air support for the Allied ground units. CBI - Burma: Day 230 of 302 of the Chinese Salween Offensive. CBI - Burma: Day 3 of 31 of the Battle of Bhamo. CBI - China: Day 2,690 of 2,987 of the 2nd Sino-Japanese War. Day 214 of 259 of Japan's Operation ICHI-GO. PTO - New Guinea: Day 325 of 597 of the Battle of New Britain. PTO - New Guinea: Day 209 of 481 of the Battle of Western New Guinea. PTO - Palau Islands: Day 63 of 74 of the Battle of Peleliu (Operation STALEMATE II). PTO - Philippines: Day 28 of 299 of the 2nd Battle of the Philippines, aka the Liberation of the Philippines or the Philippines Campaign. PTO - Philippines: Day 28 of 73 of the Battle of Leyte. PTO - Philippines: Day 6 of 41 of the Naval Battle of Ormoc Bay.